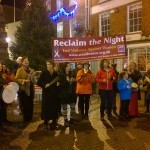 Thank you to everyone who made this year’s Reclaim the Night another fantastic event. 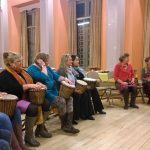 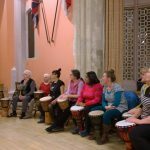 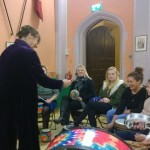 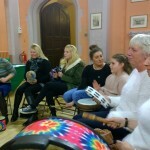 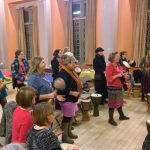 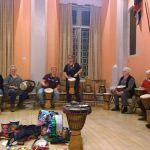 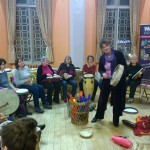 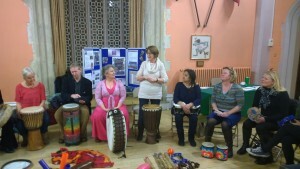 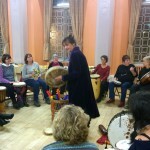 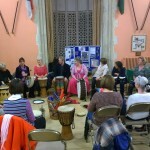 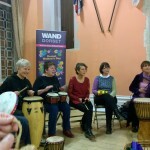 Around 30 people took part, starting with the fabulous Organic Rhythm drumming workshop. 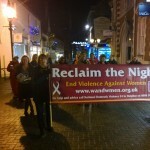 We then headed outside for our annual march through the high street. 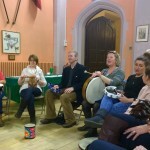 We headed back to the town hall for a delicious supper and then on to the auction hosted by our patron Tracey West. A huge thank you to everyone who donated prizes – including books from Waterstones, handmade cards and beaded jewellery, hampers from Unison, toiletries from Lush, Abbotsbury Children’s Farm, Bournemouth Aquarium, Pecorama, Athelhampton House and Vivi Lounge to name just a few. 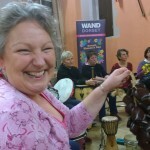 A special thank you to the West Dorset Women’ Refuge Welfare Committee who donated prizes they’d collected for an event that they’d had to cancel. 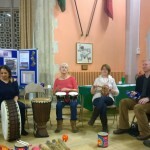 We raised a fantastic £702 pounds from the auction and tombola. 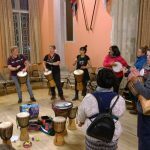 The funding raised has been spilt between the West Dorset Women’s Refuge and the Sexual Assault Referral Unit (SARC) in Bournemouth. 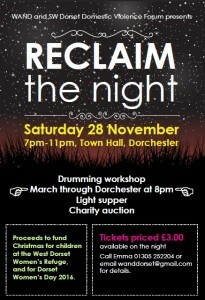 This entry was posted in Event, Fundraiser and tagged auction, Dorchester, drumming, fundraiser, Reclaim the Night on December 11, 2016 by mariac. 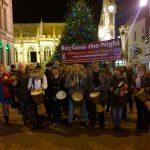 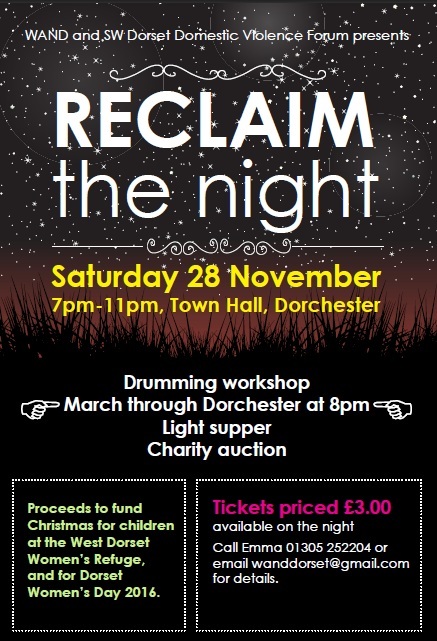 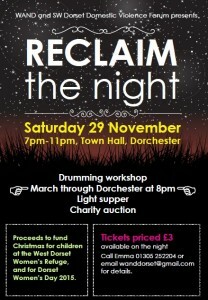 We are delighted to announce news of this years Reclaim the Night walk which will take place on Saturday 29th November at Dorchester Town Hall – upstairs from the Corn Exchange – between 7pm and 11pm. 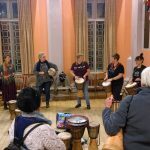 The tickets are just £3 and can be bought on the door and include an invigorating drumming workshop with the wonderful Organic Rhythm, a delicious buffet supper and a charity auction led by our Patron Tracey West. 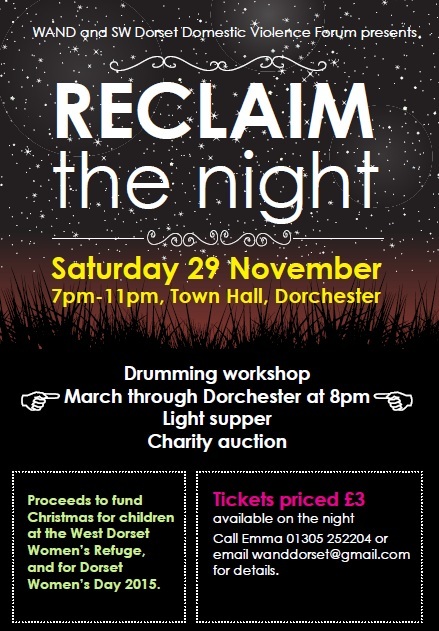 The main event of the evening will be a short march through the Dorchester streets to Reclaim the Night and for the first time, this event will be open to both women and men who want to contribute towards ending violence against women. 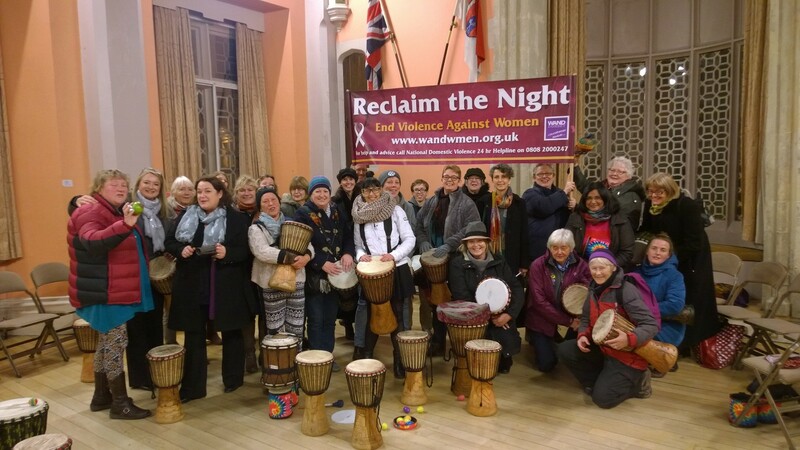 This entry was posted in Activity, Event, Fundraiser, Reclaim the Night and tagged auction, Dorchester, drumming, fundraiser, Reclaim the Night, walk on November 29, 2014 by Admin. 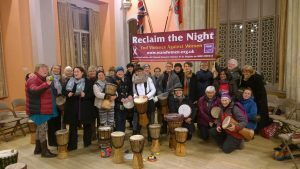 This entry was posted in Activity, Uncategorized and tagged drumming, Reclaim the Night, walk on August 22, 2011 by Admin.